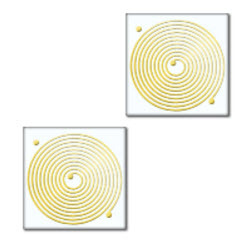 MACOM's MMI-300 Series of Spiral Inductors are formed by photolithography and plating techniques on quartz substrates. They eliminate the need for hand forming and “staking” of coil in hybrid circuits. They provide uniformity, durability and repeatability in circuit fabrication. The coils are polyimide coated to protect from ambient contaminants, and to eliminate the need for conformal coating. Quartz substrates are rugged and reduce dielectric losses. Chips may be bonded using either conductive or non conductive epoxies, and wire bonded with gold wire or ribbon by thermocompression bonding.